With its stunning climate, kind-hearted locals and amazing leisure facilities, it's easy to see why the Algarve is a holidaymaker's favourite. From secluded coves to the gorgeous beaches lined with towering cliffs, the coast is a seemingly never ending stretch of golden sand. Quaint villages, pine forests and vineyards decorate the countryside. An unbeatable cocktail of fresh air, marvellous scenery and lip-smacking local tipples. A haven for families, there's so many amazing activities for parents and little ones to get stuck into! Ride the slides at a waterpark, tackle the inflatables together at the beach or enjoy a family history lesson as you marvel at monuments. The Algarve truly has something for every taste! All aboard for the Algarve! Or at least that's what you might find yourself shrieking enthusiastically if you hop on a train for a leisurely and scenic sightseeing journey. Starting in Lagos, there's a little jaunt along the coast before the tracks take you inland. Crossing over the river and rolling through rolling hills on their way to more wonderful towns. Inexpensive and rarely in a hurry, trains are a great way of exploring the Algarve's coast, towns and countryside. Although if you fancy stretching your legs, why not drive up to the peaks of Monchique? Take in the mountain air on a hike, spot flowers and birds on a guided walk or head for the spa water of Caldas de Monchique – rumoured to cure just about everything. The coast is a haven for beach lovers, brimming with golden sands and rocky scenery. But there's more ways to enjoy this than laying out a towel. Indulge your curiosity with a boat trip to explore dark and intriguing sea caves, spotting lots of beach beauty as you go. When it comes to those famous rocky sculptures, Ponta de Piedade is almost certainly the daddy of them all. So be sure to board a vessel that takes you up close and personal with these coastal marvels. From the Moorish monuments of Silves to cobbled street towns and romantic fishing villages, there's just so much to discover on your Algarve Holiday. And that's before you even step foot on those spectacular golf courses. Fit for the front of postcards, glorious enough to grace magazine covers and the envy inducing subject of countless social media posts – the Algarve's coastline takes some beating! Sandwiched between the towering cliffs and offshore rock formations sit little pockets of sandy paradise. These quiet coves offer the perfect place to sit back and let the sounds of the sea soothe you into holiday bliss. Longer stretches offer the chance to stretch your legs against beautiful backdrops (it might be time to snap some of your own social media gold) and watersport enthusiasts can find that adrenaline rush on active beaches. 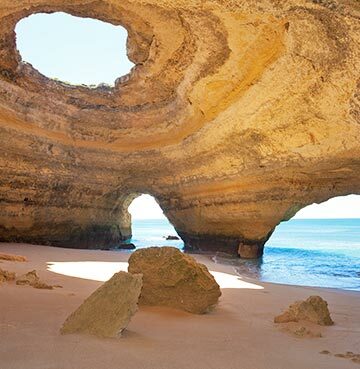 There's a beach for every taste in the Algarve, so why not find your favourite? Just like the tan seekers drawn to the year-round warmth, the Algarve's sun ripened vegetables have a wonderful glow about them. Basking in that seemingly endless sunshine, there's a freshness and deliciousness to them. So even if you normally swerve the salads back home, be sure to tuck into succulent tomatoes and tasty vegetables. Very much the side salad, the main event comes in the form of meats and fish that draw on the Algarve's location between sea and countryside. The ultimate surf and turf, you shouldn't leave without trying a fishy dish and meaty feast. Hearty stews are often packed with beef and plenty of vegetables that taste too good to be good for you! 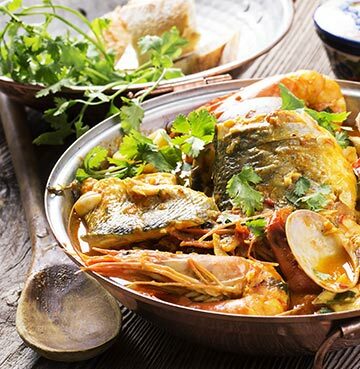 The catch of the day has never tasted fresher and you could even pick something up to prepare at your villa. 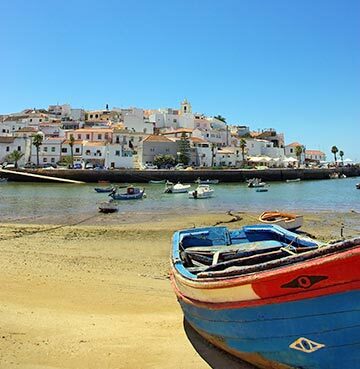 Olhão is the largest of the Algarve's fishing ports and its market is ideal for budding seafood chefs. Then there's the chicken in the room – Piri Piri. Synonymous with the Algarve and the village of Guia, there's nowhere better for sampling this spicy grilled meat. And with different wine growing regions across the Algarve, there's always the right glass of red or white to wash it all down. Fish isn't the only local delight you can pick up on your Algarve holiday – music to the ears of all you serial souvenir hunters! And if you want an authentic reminder of your time here, the markets are the place to be. From the carefully crafted cork trinkets, to hand woven baskets and dainty dangling jewellery – you're spoilt for choice as you shimmy between stalls. Shopping perfectionists will be pleased to know that markets take place every day of the week across the Algarve. There's no need to settle for a souvenir or rush that gift decision – save those euros for another day and another market. With shopping centres in Guia and Faro, the Algarve is ideal for a little holiday bargain hunting. There's nothing quite like a road trip in the Algarve, with all that coast and countryside to be uncovered at your own pace. Wind the windows down and take in the freshest of fresh air, as you drive up into the mountains. Be sure not to rush, as there's rolling hills, scooping valleys and green trees to be taken in. Not to mention all the villages that are tip top for pit stops! Picturesque Monchique is a cobbled street classic, with the highest point in the Algarve just a short drive onwards. Foia sits more than 900m above sea level, offering panoramas of sea and scenery that could captivate you for hours. Head down from those mountain views and take in the beautiful Algarve coastline up close. You might want to plan out a few stops, because there's just so many wonderful sights along the shore. Take in the golden sands and imposing cliffs of Carvoeiro, before taking the short trip to the bustling and ever popular Albufeira. 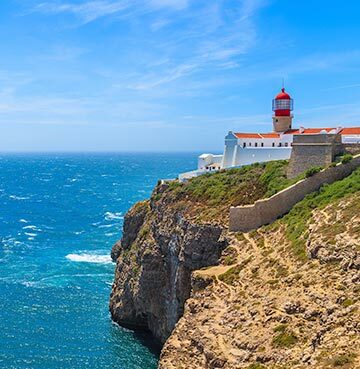 The seafaring town of Lagos just oozes seaside charm, offering a wonderful stop en route to the Cabo de Sao Vicente Lighthouse. At the very tip of the Algarve, the views here are so beautiful they'll remind you just how wonderful it is to have the freedom of your holiday hire car.